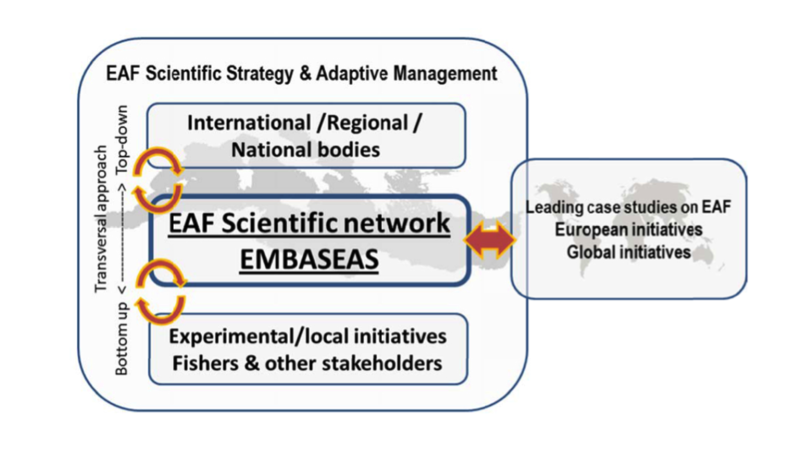 The project aims to establish a collaboration network of the key stakeholders in Mediterranean and Black Sea fisheries research and management, in order to facilitate the full application of the Ecosystem Approach to Fisheries. The Consortium comprises research institutes with strong expertise in the field of fisheries research and assessment and offers a broad geographical coverage of the region. The project adopts a thorough approach, which encompasses multi-aspect activities: from stock-taking and data gathering, through needs assessment and coordination, to training and capacity building. The final goal is to strengthen the scientific basis for building a generic framework to implement EAF in the Mediterranean and Black Seas. The main contribution of the project is the establishment of a network to coordinate scientific research to make EAF operational. The project had a strong training and capacity building component in order to help harmonize data collection and methodologies used in fisheries assessment and management in the Mediterranean and Black Sea. The project served to establish the guidelines for the application of the Ecosystem Approach to Fisheries in the Mediterranean and Black Sea, both in EU member states and third countries. The project was organized in 6 workpackages: i) Coordination, ii) Review of current knowledge in data collection and methodological practices in assessment and management, iii) Identification of data needs, quality, harmonization, methodologies and models for EAF, iv) Establishing coordination with the assessment and management international/regional bodies, v) Training and capacity building. Symposium. Dissemination component, vi) Strengthening the scientific basis of EAF application in Mediterranean and Black Sea fisheries.